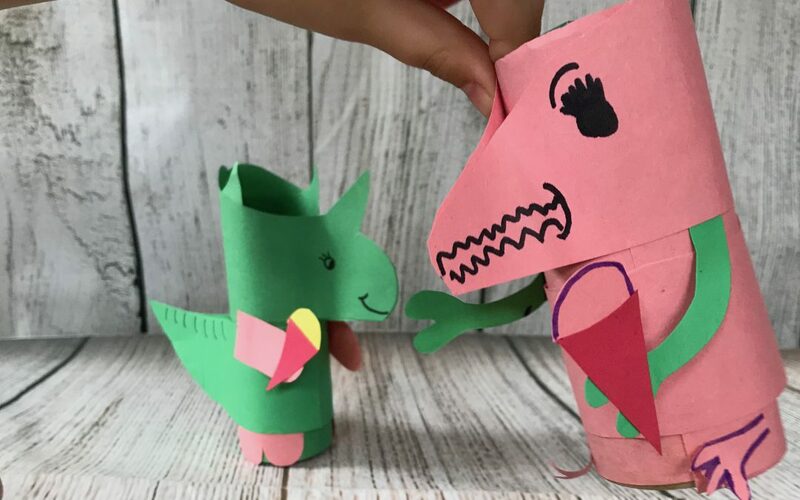 Oh Dear, no more toilet paper… that is usually not so very nice, unless you are waiting to make some super cute dinosaurs! Tomi and Mimi had two empty toilet rolls and really wanted to make dinosaurs with them. They love dinosaurs. The famous, big T-rex, a Triceratops with its three horns or a Pteranodon that could fly high in the sky. Tomi and Mimi love them all. And because they also love ice cream, the Dinos had to have an ice cream cone. Yum! First you cover the toilet roll with your favorite color paper. Cut a strip, fold it double and cut a pointy end. Now unfold, that is the tail. Glue the inside of the fold against the roll and glue the tips together. Cut another strip, fold it double and cut a pear shape face. Glue the inside of the fold against the roll and the tips of the pear shape together. That is the face. Paint some eyes and a mouth on both sides. Cut out some feet and arms and glue them against the body of your Dino. If your Dino likes ice creams too, cut out a triangle and glue a circle at the top to make an ice cream cone. Glue it at one of their hands. Tomi and Mimi played the rest of the afternoon with their dinosaurs. We hope you will have as much fun with your toilet roll puppets as they had. Happy crafting and happy playing!